Sargam Griffin’s studio is situated among the vineyards in California’s Dry Creek Valley. The land is in the heart of Wine Country, which has a climate and light that is reminiscent of Italy. In fact, it was while viewing the Collection of Modern Art in the Apartment of Alexander VI at the Vatican, that she knew she must focus her energy on painting abstract fine art. Immediately upon her return home, she converted what was once a garage into her studio. Today, she works in a studio that has sweeping vineyard views and an abundance of natural light streaming into the workspace. Before taking the brush into her hands, an inner sense arises into seeing the essence of the next painting. Many things may initiate this inspiration. A feeling may emerge during meditation, a particular light may spark an idea of a color combination, or a new composition may materialize while driving along a country road. For Sargam, the creative process is always present. Starting from a white or black background of oil paint or gesso, Sargam applies the paint with palette knives, brushes, delicate cotton balls, belt sanders even her finger. Each work starts with a high-contrast, basic layout, and then translucent layers and texture are added. Light plays a big role in each painting. That is why it is easier work when the studio door is wide open, allowing the light to flood the space. Conversely, when it is dark outside I focus on the details.Oil pigments are of the highest quality and applied to canvas or panels, which are then finished with varnishes, waxes or resins. A great deal of time is spent on the panels, which may have up to 40 layers. Working methodically back and forth, finding the balance between soft and hard edges, depth and lightness, Sargam creates great depth and will go to any length to achieve it. 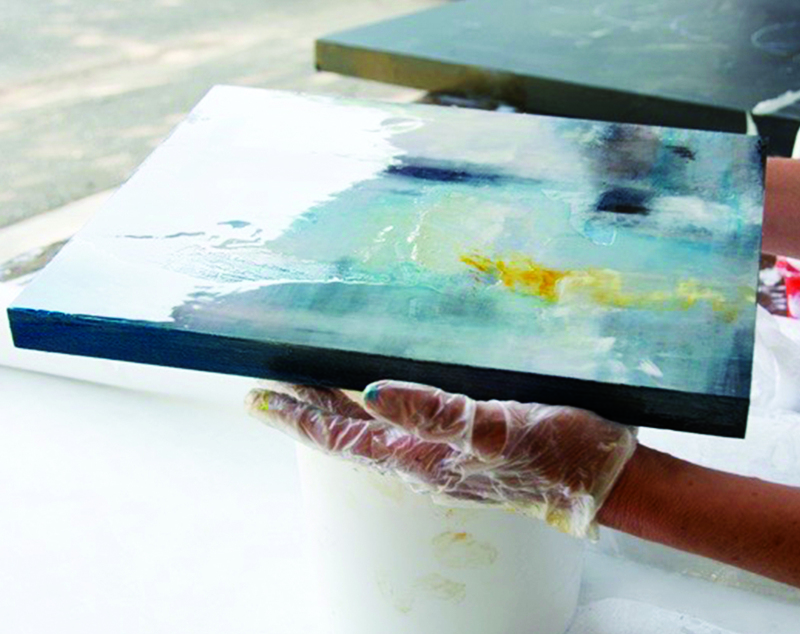 Because oils require long drying times, Sargam will usually work on several paintings simultaneously. Sargam’s methods strike a balance between the technical control of the medium with the creative process. Usually resulting in an unexpected quality and the surprise of what it has become. Some artists want to make people think. Sargam wants to make people feel. While she finds inspiration all around her, her paintings are created from within.